Home > Google News > Google SEO > Google's Matt Cutts On What If My Site Goes Down? Are My Rankings Doomed? Google's Matt Cutts On What If My Site Goes Down? Are My Rankings Doomed? The topic of how Google handles downtime and how that may impact your rankings in Google's search results is nothing new. In short, short periods of downtime, even a day, should not have a negative impact on your rankings. Prolonged downtime will have a negative impact on your rankings. Why? 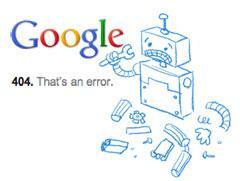 Google doesn't want to send searchers to sites or web pages that are down and offline.